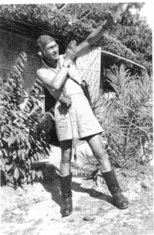 George Manderson, a survivor of the Burma affair, originally mustered as a Wireless Operator to serve in the UK, North Africa and the Middle East. Retrained as Navigator, he was then posted to India, joining 211 Squadron as a Flight Sergeant in the 1943 period of regrouping after the loss of Singapore and the disastrous Sumatra and Java campaigns. 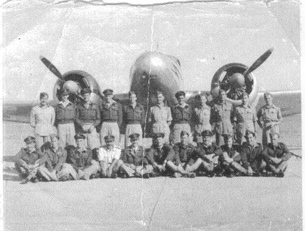 Intruder operations over Burma saw 211 Squadron once again undertaking a heavy workload, with 1,790 sorties carried out from January 1944 to May 1945 for the loss of some 36 crews (three during training), of whom no less than 6 crews were subsequently recovered from the horrors of Rangoon Jail. November 1944 was a good month for George Yeaman Manderson: commissioned a Pilot Officer with effect from 21 July (London Gazette Supplement of 7 November), and awarded the DFC (London Gazette 21 November, both richly deserved. After his tour with 211 Squadron, George went on to serve in a transport squadron in rather more luxurious circumstances, returning to the UK from the Far East in 1946. He worked in Dundee for ICI until he retired in 1982, to Carnoustie where he continued to enjoy the odd round of golf, occasionally in the company of Bill Baird. A bout of ill health in 1991 spurred George into writing his memoirs, Five years and a bit! completed around 1996. His sources included copies of the 211 ORB for the Burma period made for him by Ron Gilley. His complete memoirs are lodged with the World War II Experience Centre in Leeds, where they are accessible by personal visit. In 2001, George dipped very generously into his work in contacting me and Adrian Fryatt. The text which follows is George’s account of early March 1944 operations, a brief extract from Five years and a bit! George also kindly provided a set of photocopies of photographs with quite detailed captions, identifying a number of Squadron personnel and including a number of men later held PoW in Rangoon Jail. GY Manderson DFC died on 14 December 2001, at about the time his story first appeared on this site. Along with Sqn Ldr Thomson we were to carry out a rocket attack on Minbya and any craft in Hunter Bay. We fired our rockets in four pairs and then strafed some sampans in the Bay. The village looked burnt out and deserted. In both February and March we had been carrying out low level formation dummy attacks on our own strip at Feni. Now for the real thing. ‘B’ Flight, F/O Luing and F/O White, W/O Adamson and Flt Sgt. Ferguson. ‘A’ Flight, F/O Fuller and Sgt. Cook, W/O O’Mara and Flt Sgt. Manderson. Aircraft ‘W’, Sqdn. Ldr M-R.
Strafed a bomber (Helen) at Zayatkwin and was then attacked by fighters. Took evasive corkscrew action for eight to ten minutes at deck level. Shadowed towards the coast for twenty minutes and returned to Base. Claim one bomber damaged. Strafed and damaged fighter at end of runway at Zayatkwin and obtained hits on a nearby Light Machine Gun (LMG) post. At Hmawbi found many fighters airborne, chased one to end of runway and fired a burst with possible damage. Claim one fighter destroyed, one fighter possibly damaged. Aircraft ‘M’, W Cdr Meagher. Attacks by two fighters just North of Pegu and took avoiding action. Strafed a twin engine machine at Zayatkwin, undercarriage collapsed and aircraft went down on starboard wing. Strafed fighter taxiing out which turned over on its back. At Hmawbi had hits on bomber in pen. Chased by two enemy aircraft for twenty minutes and took successful evasive action at zero feet. Claim two bombers damaged, one fighter probably destroyed and pilot killed. I can give a fuller account as far as we were concerned. Our aircraft was furthest out on the port side of the formation of five and had to sweep round to starboard and actually came in to attack from the South West, and went down the South side of the runway, going East. Fighters were taking off, some were airborne doing barrel rolls, and the AA gunners were very busy. Red was firing away down the runway and then made a steep turn at the far end where there were bombers in pens. He kept the cannons going then headed back along the runway. About halfway along, and aircraft all over the place, we saw Aircraft ‘K’, F/O Fuller, engines on fire, heading back towards the bomber pens, where it crashed and exploded. The explosion was such that I felt sure that he had crashed into an occupied pen. M-R also claimed that Fuller had attacked the fighter that was on fire at the other end of the runway. Meanwhile, we carried on due West, full boost at treetop level, with me keeping a lookout for pursuit. 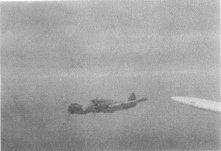 A fighter appeared on our starboard at about 2.000 ft. and Red took immediate evasive action, but no attack came. The Jap, however, continued on a parallel course to us, which was now slightly South West instead of the North North West we required to get home. This course was also taking us towards Bassein, the main Jap airbase in the South West of Burma. We passed just to the South of the base and then lost sight of our fellow traveller when we reached the coast. With hindsight, it was possible that the fighter had scrambled in a great hurry just as we were arriving at Zayatkwin and may not have been fully armed or fuelled. There was also the possibility that he just lost sight of us. Our Beaus were jungle camouflaged on the upper wing surfaces, which made them difficult to see from above, particularly over the profuse vegetation of the Bassein Delta. There was no sign of any of our formation, all having tangled with the fighters. Our main problem was now fuel. Normal cruising speed was 180 knots, just over 200 mph., but during attacks this would be pushed up and, with higher speeds, petrol consumption increased rapidly. The pilot pushed the throttle levers forward to accelerate. As a precaution, there was a thin wire across the throttle housing, referred to as the “gate”, which, in emergency, could be broken and speed increased to a maximum of approximately 300 mph, which could give us a chance against some fighters. It was recommended that Maximum Boost should be used only in an emergency, and only for a short time. In addition to our speedy departure, we had also travelled additional miles off course. The fuel gauge readings, when we cleared the coast, made us less than optimistic. Red throttled back to 150 knots and we flew just off the shore at sea level, determined to get as far as we could. We didn't alter course when we came to the Jap occupied adjacent islands of Cheduba and Ramree, but flew right between them. About eighty miles further up the coast was the all weather 'drome of Akyab, Jap held since 1942 and currently used by their fighters for operations in the Arakan. On our present course we would be passing close to the island but, with fuel gauges getting lower and lower, we decided to send an SOS to Chittagong, giving details of call sign, position, and fuel shortage. Beyond Akyab there was a further eighty miles before we could reach our front line near Maungdaw. We passed at Akyab at sea level, thankful to see no air activity, and then over the bomb line. There was a forward landing field at Cox's Bazaar, close to the lines, but Red decided to fly on to Chittagong, another twenty minutes flying, where they had full facilities. We landed at 1212hrs with gauges showing zero. At a preliminary debriefing here, and reporting our brush with the fighters, the intelligence officer tactlessly remarked that we had been very fortunate as 'the Spitfire' had had a job getting away from them the other day. Red's retort was unprintable. I had already reported in on landing to cancel my SOS, but was informed that the message had not been received. This may have been due to us being down at sea level when I transmitted We refuelled and returned to Bhatpara to again quash reports that we were ‘missing presumed...’. Ken Fuller RAAF and Sgt. Cook RAF were the only casualties. Claims in total were two bombers and two fighters destroyed and six fighters damaged. We were accorded one fighter damaged. A trip to remember. Four aircraft attacked road and rail communications North of Mandalay. The first two were chased by fighters after successfully strafing trains, with one having been hit in the engine and fuselage. The second pair attacked bridges with rocket and cannon. Aircraft ‘R’, F/O Luing and F/O White, who were with us on the Rangoon airfield strike, did not return. We carried out rocket and cannon attacks on bridges and had hits on many loaded bullock carts. During one strafing run a single bullet hit the windscreen just where the cannon sight was, leaving a nick on the bullet -proof screen. This was from a Jap rifle, which must have been fired from dead ahead and says something for the Jap Infantry. We lost W/O Depew RCAF and F/Sgt. Woolley, who were attacking transport in the Taungup area. The accompanying aircraft reported that they saw Depew appear to pull out of his attack -dive too late, hit a tree, and burst into flames. ‘Red’ O’Mara, an American in the Canadian Air Force, and George Manderson’s pilot. O’Mara and Manderson. March 1944 Bhatpara. Officers and NCO Aircrew, 1943. 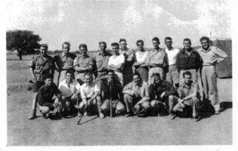 Back Row L to R: 3- Mearns and 4- Gamlin (PoW's released from Rangoon Jail June [sic: May] 1945). 7- Bewsher. Killed February 1944. 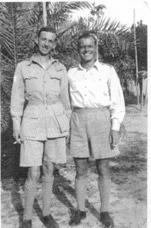 8- Keith Cuddy (PoW released from Rangoon Jail June [sic: April] 1945). 9- Adamson Missing 24th March. Front Row L to R: 1- Thompson Wounded. Returned to flying. 2- Chatterton Survived War. Remaining five all casualties. 3- W.O. 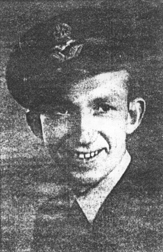 Hall, a Rhodesian Pilot [sic: a Canadian], was reported missing 7th May. Later heard Japs shot him resisting capture. He always said he wouldn't be captured. His Navigator, F/Sgt. Parker died in Rangoon Jail. Posted home on Medical grounds December 1944. From L: Ron Gilley DFM; Tomlinson PoW released Rangoon Jail. Rosie Vaughan missing Ist August. Behind Bowden is Carruthers, spare Navigator. His Pilot was back at Ranchi for further training and didn't rejoin until the Squadron were converting to Mosquitoes. On a training trip he crashed into a native village. Carruthers had been posted home in 1944 [George’s recall is in error here: John Carruthers completed his tour with 211 Squadron in April 1945]. Fortunately, McCormick, next to Bowden, was F/Lt Lockyer's Navigator, who became our 'A’ Flight Commander in May. On 2nd June we took off with Lockyer at 0250 to try and get through to the Central Plain with a secondary target, Taungup Coastal area. We got off OK but weather was dreadful, low cloud, torrential rain and ferocious wind. After flying south for less than 100 miles, Red and I agreed the cyclonic conditions were impossible and we called up Lockyer to say we were turning back. Lockyer, who had our Intelligence Officer, F/O Bishop, standing behind him, carried on a little longer before returning. We got back to Base at 0400hrs and made a safe landing, if somewhat hairy. Lockyer tried for Chittagong where there was full night flying facilities. Coming in to land he clipped the tree tops and crashed into the Bay at 0435. At first light, F/Sgt. McCormick was picked up by a Rescue Launch, clinging to the tailplane, the only bit afloat. Lockyer's body was recovered, but there was no trace of [the] IO [Bishop]. McCormick recovered after Hospital and survived the War. The remaining three are George Freeman DFC, Dickinson who has been in touch with you with his snaps, and yours truly. 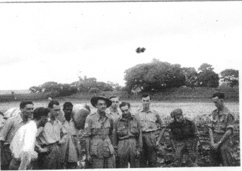 Snap taken just after strike on the Rangoon group of airfields, 6th March. F/O White did not return from an op. 8th March. Road and rail North of Mandalay, fighters reported in the area. W/O Adamson with another Navigator, F/Sgt Moss, were reported missing on 24th March near Thazi. Two other crews reported contact with fighters near the railway. Meiktilla airfields were close by. We were one of six crews who carried out an attack on these airfields on 19th March, but no aircraft were there. 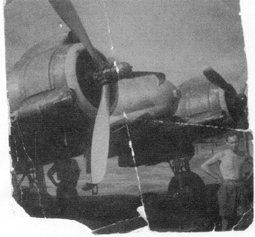 Japs were tending to fly in to Burma, do a sortie, then fly out again or down to Rangoon. Back: Bert Nash, Navigator. 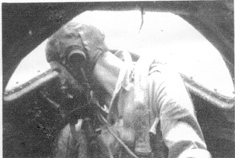 6th May, Bert's Pilot, Peter Bell, signalled that they had been hit near Mandalay and were struggling to get back. Last signal very faint at 0851. We took off with two other crews at 1308 to look for them. Weather was very bad over the hills and the 14th Army Unit found their bodies in the Chin Hills. Both were Scots and Peter Bell's family farm is only a few hundred yards from my home in Carnoustie. Red O’Mara, sitting alongside, had his rest period as Test Pilot. Front: Fred Gamlin, Pilot, PoW, released from Rangoon with Navigator, B. Mearns. I'm next with 12 bore. Ron Gilley DFM, with racquet. Ron provided me with copies of Squadron operation records January to mid-October 1944 and summary of 211's operational achievements. Died two years ago. He completed his 60 operations early September 1944, the first to do so. Muller-Rowland and he were our most successful crew. M-R, who had a DFC with 45 Blenheim Squadron and wounded in Batavia, received a Bar to his DFC and the DSO. He took over 211 when W/Cdr Meagher, DFC, DSO, took over the Beau Wing (211, 177, and 27) as Group Captain. M-R had his rest period as Test Pilot. His two Brothers, both Pilots, one a twin, were killed during during the War.He was with De Haviland post-war and was killed when a DH108 he was testing blew up in mid-air near Farnborough. Jock Ferguson is at the right. He was Adamson's Navigator on the Rangoon strike but was sick when Adamson was lost. Crewed up with Flt Haakinson a Canadian, they were missing on 17th June following distress call picked up by other aircraft. Looks like Ron Gilley underneath. Muller-Rowland had more damaged aircraft. Ditching, shallow water on beach, belly landing (finished up level with maintenance section). Ground fire damage on lots of occasions. Willingdon New Delhi 1945. Expeditor squad. Navigator standing. Pilot squatting in front. I'm 2nd from left. George Freeman 4th, and Ron Gilley 7th from left. First pilot on left is Roy Bateman DFC did most flights with him. He was with 617 Squadron (The Dambusters) though not on that strike. Joined us on VE night. Brought tonga horse [ie the horse from a tonga cab] into Delhi Mess Dining Room, got our only WAAF Officer to mount it and then prodded it with a fork. We had some scrapes during our remaining months before demob.